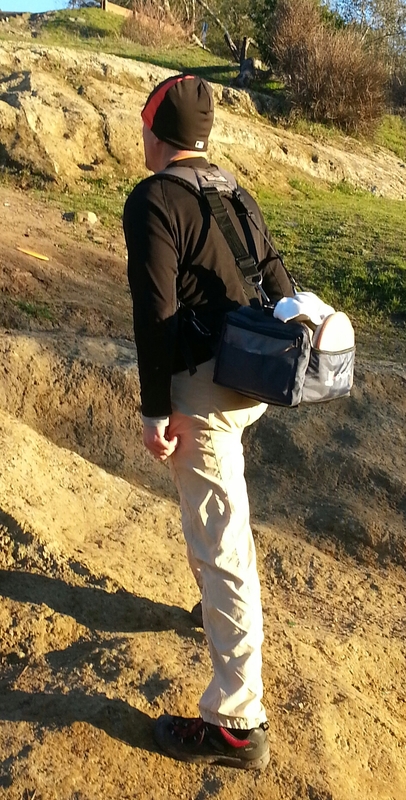 After using the DGA Elite Shield bag for more than a month, it gets my endorsement as my favorite bag ever as well as in my opinion the best accessory product ever marketed by Disc Golf Association. Time will tell whether it passes the all-important durability test, but it seems to be very well equipped in that regard as well. It should be mentioned right at the beginning that one’s preference of disc golf bags – like the golf discs they are designed to carry – is a highly subjective matter. Most significant in this regard is size. Some prefer the minimalist approach: a bag that is as small as possible and meant to hold a few discs and maybe a small water bottle. Others represent a rather different philosophy, and represent the “If there is even the remotest chance I might need it, I want to carry it” school of thought. These folks want to carry 30+ discs, two wardrobe changes, enough food and water to survive in the wilderness for 10 days, and seven miscellaneous pockets and straps full of ‘other stuff’. I prefer something between these two extremes. I want room for around 14 discs, a large water bottle, and the outer layer of clothing I’ll remove halfway through the round. Several convenient storage pockets for my snacks and little stuff, too. And now that I’ve gotten used to backpack-style straps, my bag must at least include that as an option as well. Finally, I’d like to keep the cost reasonable- under $75. Obviously not an overly large bag, the DGA Elite Shield nevertheless easily holds 16 discs with plenty additional storage room. So keep in mind these personal preferences when I say that the Elite Shield bag by DGA is the ideal bag for me. Now, on with the review! The company is best known for its dominant share of baskets installed worldwide and its pioneering status in the sport (perhaps you’ve heard of ‘Steady’ Ed Headrick, PDGA #001, Father of Disc Golf, inventor of the Pole Hole catching device), but also markets its own line of discs, apparel and accessories. They try hard to innovate in everything they do, and this bag really hits the mark in that respect and many others as well. In fact, there are so many cool features included on this bag – a couple which are completely unique to the Elite Shield – that I’m going to list them bullet-style, along with impressions after a month’s worth of use. Shield Pocket- This is the stand-out feature for which the bag is named, and it’s a hard shell storage compartment designed to keep a phone, sunglasses, or anything else you want to keep from getting broken or wet safe and sound. DGA general manager Scott Keasey told me he got the idea after watching a bag (turns out it was HIS bag) get backed over by a car. I’m not sure it would withstand the weight of a car, but I love having a place where I know my breakables will be safe. Like most great innovations, it’s simple but brilliant. Gel Foam back padding- I’ve personally never had an issue with my bag feeling ‘hard’ against my back, probably because it comes into contact more with my backside than my back. Still, the padding is quite cushy and I can notice the difference. Retractable Towel Lanyard- This is a detachable device that consists of a clip that attaches to a hook inside the large side pocket on one end, another clip that attaches to a towel, and a length of strong but skinny string that automatically retracts back into the device. I didn’t know at first whether I’d use this, but find that I like not having to deal with stuffing my towel back into the bag after using it. I’ve never used towel clips before because they required me to use the towel right next to the bag- which is awkward. Now, thanks to the lanyard I can have my cake, eat it too, and not worry about losing it (the towel I mean, not the cake). PVC diamond-plated water resistant bottom- This is actually a biggie for me, as I play in pretty rugged terrain and the bottom of bags here is usually the most likely failure point. Most bags are not only made of the same material as the rest of the bag, but are completely flat as well. The Elite Shield’s bottom is rugged plastic, and also includes ‘feet’ that keep the bottom surface slightly elevated to reduce exposure to moisture and other wear-and-tear. Foam insulated beverage pocket- My favorite parts of the beverage pocket are elastic gather at the top which keeps even my small aluminum bottle secure, even when I’m running, and the mesh plastic bottom. I hate it when my bottle leaks for whatever reason and I discover a pool of liquid accumulating in the holder. The mesh will prevent that from happening. One small downside is that a large Nalgene bottle is a tight fit. The fit is actually nice and snug and not too tight, but getting it in takes some wrangling. Using the included customizable dividers, 14 discs fit snugly in the center of the main compartment, providing easy access to the discs in the middle and ample room for towels and clothing on either side. The more standard features of the bag are all quite agreeable as well. It comes with a skinny should strap, but the four well-placed connectors accommodate the backpack straps of your choice. DGA sells it packaged with their Gel Strapz, but I attached mine and they work perfectly. The storage pockets aside from the Shield pocket are all I could ask for One large zippered compartment and another small one outside of that, with a couple small ‘tuck’ sleeves outside both for a mini, pencils, or whatever (The smaller one fits my School of Disc Golf cards nicely. The putter pocket presents one small drawback for me, but only because I will sometimes jog during and between holes on the course when time is tight. I keep two putter in the pocket, and a couple times now the one on the outside has popped out. Absolutely no concern if you’re walking on the course like most people, but speed golfers be aware that this might happen. You can see from the images above that this is a medium-sized bag. I personally have room for 12 discs in the main compartment in addition to the two in the putter pocket, and using the included configurable dividers the discs sit neatly in a middle section, with storage in both side-corners of the main compartment for clothing, extra towels, etc. This bag can obviously hold many more than 14 discs. In fact I recently met a guy at a local course that recognized me from the TV show, and I noticed he was using an Elite Shield bag. When I told him I’d be reviewing it soon, he said he was able to fit 30 discs! Way more than DGA intended with the design, but it gives you an idea of the capacity. DGA’s website – with the enviable URL of discgolf.com – includes a great gallery of pictures of the Elite Shield bag. It lets’s you see the bag from every conceivable angle. If like me and Baby Bear you prefer a bag that isn’t too small, or too big, but just right, and also includes a bunch of cool extras, and is also designed to last- yet doesn’t cost too much, I think you’ll like the DGA Elite Shield bag. I Have been using my Elite Shield for a little over a year now and it has held up amazingly well. I play in Southern Louisiana which means morning rounds are wet with humidity. I don’t use a stool so the bag is always on the ground too. 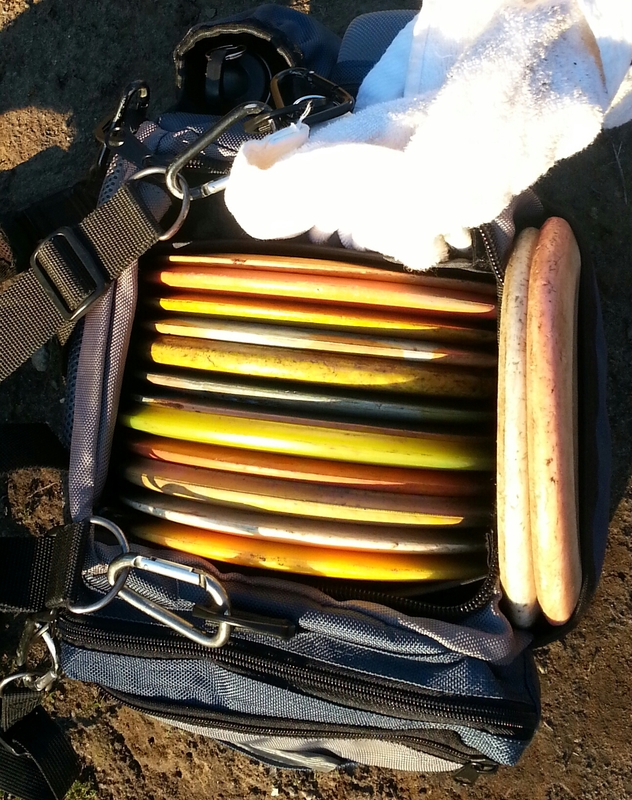 I carry 20 Discs and usually stuff a Hoodie in the big side pocket so it pushed quite often. No stress on the strap areas or the bottom of the bag. To get 2 putters in your front pocket, Slide your putter in 1st then put 2 drivers in with it when you put it up after a round. I did this for one night and its perfect. The quality of this bag for the money is 2nd to none. Great Review! I was stoked with this bag until the strap attachment point tore off after 5 months of use. Still waiting to see if DGA stands by their product. I don’t recommend this bag because it fell apart after 5 months of weekly normal use.